We provide a range of services related to the maintenance and service, winterization and repair, inspection and testing of fire suppression systems, extinguishers, automatic fire sprinklers, be it a commercial, retail, or industrial appliance. 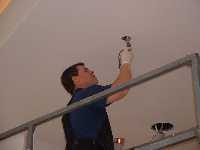 Our specialists take care of the full installation of the fire suppression systems, sprinklers, etc. 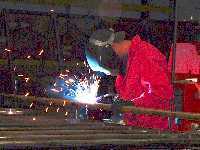 We also have a full-time certified welder in our shop, along with threading and grooving machines to meet your fabrication needs. Feel free to bring your fire extinguisher to our office for service, or our on-site technician would be happy to come see you. 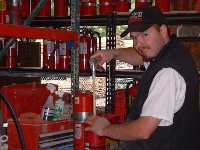 Our certified technicians are qualified to provide maintenance and/or repair for your fire suppression systems. Our qualified service technicians have been trained to perform annual inspections, winterizations, and repairs on your automatic fire sprinkler systems. 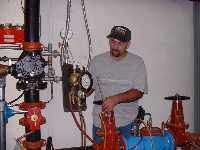 Our certified backflow assembly testers will come to your location to test and/or repair your backflow prevention device. Our qualified sprinkler fitters are experienced with installing and repairing fire sprinkler systems in many diverse applications, including commercial, industrial, and retail spaces. We have installed over the years, sprinklers and fire suppression systems in a large number of commercial, retail, official and public building and facilities.